July 8, 2013 5 comments on "How to Make Chicken Gravy Mix"
My kids love homemade chicken gravy and mashed potatoes. To make the gravy I have bought many, many packets of chicken gravy mix. 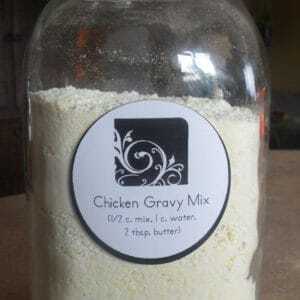 If you want to make your own easy chicken gravy mix, here is the recipe. It’s less expensive, and a lot more healthy! Note: When you are shopping for chicken boullion, make sure to check your labels. By making your own mix, one of the things you are trying to get away from is the MSG that is added to gravy packets. If you look at the jars of chicken boullion, you will find that many of those also contain MSG. I was able to find a natural boullion that did not contain MSG and it didn’t cost very much more. This is the chicken boullion I use. It is MSG and GMO free. Mix all ingredients together, and then store in a quart sized canning jar or other airtight container. To make the gravy, melt 2 tbsp. butter or margarine in a small sauce pan. Add 1/2 c. mix with 1 cup milk or water. If you stir it in really well with a whisk you won’t get any lumps in your gravy. Bring to a boil and then turn heat down and simmer until gravy thickens. Add more liquid for a thinner gravy. We tried this gravy out the other night and it is delicious! I thought it was MUCH better than the store bought gravy mix. It definitely passed the kid test. Makes 4 batches of gravy. 5 Comments on "How to Make Chicken Gravy Mix"
Could you use bakers friend flour which is very fine so you don’t get lumps? Hi! You could definitely try that, I don’t see why that wouldn’t work.